NEW YORK (CNNMoney) -- In another day of sharp swings, U.S. stocks closed significantly higher, despite clocking large losses through much of the day. By Tuesday's end investors ignored the S&P 500's early slide into bear territory and furiously bought back into stocks. The S&P 500 (SPX) closed up 25 points, or 2.3%. The Dow Jones industrial average (INDU) ended up 153 points, or 1.4%. The Nasdaq Composite (COMP) edged 69 points higher, or 3% by the close. The tech-heavy index ended the day higher, despite Apple's 0.5% slip. Apple disappointed investors and consumers when it didn't announce the hotly anticipated iPhone 5 at its annual meeting. Both the Dow and Nasdaq still remain just a few percentage points shy of falling into bear territory. Investors continue to fret about Europe's worsening debt situation and a possible slide into a global recession. "We're expecting continued heightened volatility until we get resolution on Europe," said Thomas Higgins, global macro strategist at Bank of New York's asset management division. Adding to the fears surrounding Europe, Moody's downgraded Italy's sovereign debt shortly after the U.S. markets closed. Despite the late-afternoon rally, certain trading themes are also causing concern for investors. Among them: stocks moving closely in connection with one another, and stocks, bonds and commodities selling off in unison over the past few weeks. "When things get highly correlated, historically, that precedes big down moves," said Sal Catrini, equity product manager at Cantor Fitzgerald. Not only did the S&P 500 fall into what's considered a bear market Tuesday -- tumbling 20% from its recent April 29 high of 1,363.61 -- but the index also dropped just below a technically and psychologically significant barrier of 1,100 Monday. "Once 1,100 was broken, people started to see significant downside," said Dan Greenhaus, chief global strategist at BTIG. In the summer of 2010, the S&P 500 traded around 1,025 and 1,050. Greenhaus says that those levels could be the next likely floor. "S&P in all likelihood is launching another leg down," said Clark Yingst, chief market analyst and equity strategist at Joseph Gunnar. Fed Chairman Ben Bernanke offered a grim assessment of the U.S. and global economy. His pledge to take further action if necessary to promote a recovery did little to sway investors. Stocks staged the late-day rally long after Bernanke's comments. "An easier Fed is better than a tightening Fed," said Greenhaus. "Market participants have probably convinced themselves there's little the Fed can do now." Casting a shadow over all of Bernanke's comments and any economic reports in the U.S. is an ambient apprehension over whether Greece can meet its debt obligations, and what a possible default might mean the global banking system. Investors bought up bank stocks before the close. In conjunction with the broader market, Morgan Stanley (MS, Fortune 500), Bank of America (BAC, Fortune 500), Goldman Sachs (GS, Fortune 500), and Citigroup (C, Fortune 500) staged a late-day rally, ending sharply up. Each of the banks had hovered near 52-week lows for much of the trading day. Is Morgan Stanley the next Lehman? Bank stocks in Europe traded down on reports that Franco-Belgian bank Dexia Group might be the first victim of the sovereign debt crisis. Rumors continue to swirl that Belgium and France might be forced to intervene to bail out the bank soon. The European financial sector had one key outlier throughout the day: UBS (UBS). Its shares rose after the Swiss bank said it expects to post a "modest" profit for the third quarter despite a rogue trading incident that cost the bank $2.3 billion. Energy and commodity stocks which weighed on indexes throughout the day ended up, with Exxon (XOM, Fortune 500) and Chevron (CVX, Fortune 500) among the biggest drags on the Dow. Copper closed the day down, but oil prices moved up at the market close just into positive territory. The second day of the new quarter so far looks much more auspicious than the first. On Monday, stocks kicked off the fourth quarter with a huge sell-off, as worries about Greece's solvency remained in the spotlight. Greece has slashed spending, reduced wages and raised taxes in an attempt to bring its debt under control. But the debt-ridden nation will miss key deficit targets for this year and next, according to the draft budget announced by the Greek cabinet. Companies: Shares of American Airlines parent company AMR (AMR, Fortune 500) bounced back after plunging 32% Monday on numerous reports that the company was facing a threat of bankruptcy. AMR is one of the few major U.S. airlines that did not go through bankruptcy in the last decade, but it is forecast to report its fourth straight year of losses in 2011. Shares of Yahoo (YHOO, Fortune 500) edged higher Tuesday, as rumors swirl about a possible sale. The struggling online media company reportedly engaged Goldman Sachs and Allen & Co. to help it find a buyer. Yesterday Yahoo also announced that it would partner with ABC News to share content, reporting resources and original videos. Shares of YUM! (YUM, Fortune 500) Brands, the owner of KFC, Pizza Hut and Taco Bell, were up in post-market trading, after the company reported positive earnings. Asian markets ended lower. The Hang Seng (HSI) in Hong Kong sank 3.4% and Japan's Nikkei (N225) shaved 1.1%. The Shanghai (SHCOMP) stock market is closed this week for a holiday. Currencies and commodities: The dollar was little changed against the euro and Japanese yen, but gained slightly against the British pound. Oil for November delivery moved up 2 cents to $77.63 a barrel. Gold futures for December delivery shaved $41.70 to $1,616.00 an ounce. 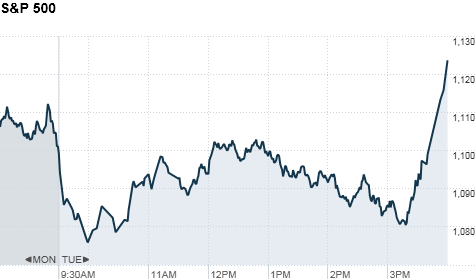 Bonds: The price on the benchmark 10-year U.S. Treasury was up slightly, pushing the yield down to 1.814%.